Inundated by the explosion and diversity of data across your enterprise? Unable to keep up with demands from data scientists, analysts and business users alike? Challenged with how to reconcile traditional EDW with modern Big Data? 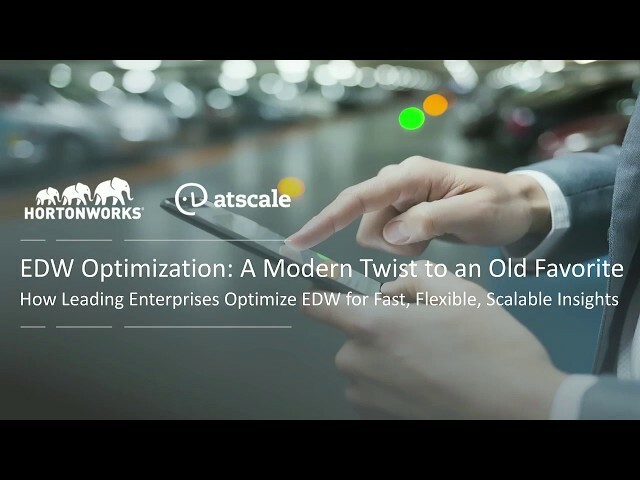 Join this webcast to learn how EDW Optimization will help you capitalize on your existing big data investments in tandem with modern innovations, streamline repetitive and complex ETL, and give users timely access to the data that matters, no matter where it begins its life. BI and Big Data veterans Carter Shanklin, Sr. Director of Product at Hortonworks and Josh Klahr, VP of Product at AtScale will deliver this interactive session covering insights, real-world experiences, and answering questions from the online audience. They’ll share real customer stories across industries and pain points to bring to life how you can use EDW Optimization today to drive insights across any and all of your enterprise data – quickly, simply, securely, and widely.